Flyte Camp, located in Bend, Oregon, USA, is a vintage travel trailer restoration and custom renovation shop. Since its establishment in 2010, owners Justin and Anna Scribner have expanded the company’s project to include the television series ”Flippin’ RVs“ for the popular Great American Country network and have recently filmed a new series for Travel Channel titled ”Beachin’ RVs“. Turning their passion into reality, Justin and Anna have also developed their own line of vintage-inspired travel trailers, the Flyte Camp Neutron. Another challenge is compounded during the filming of the television series, when the film crew and their equipment makes for even tighter working conditions. Employees must be able to move large, heavy trailers between workstations without the risk of damage to irreplaceable parts. The harsh weather conditions during Oregon winters add to the challenge as trailers are moved from an outdoor staging area into the restoration facility. Manoeuvrability and precision are key to keeping multiple simultaneous projects moving. For the Flyte Camp team, their work is a labour of love and they welcome the opportunity to focus on their craft. With Crown’s Wave Work Assist Vehicle, they can manoeuvre safely and efficiently around each vehicle and within their facility, eliminating the inefficiencies and safety risks of ladders and scaffolding. The Wave helps them maximise productivity, enabling workers to optimally position themselves and their tools to work at height for hours at a time without interruption. Eliminating the instability of ladders and temporary work platforms has dramatically decreased the risk of injury, while avoiding frequent trips up and down ladders has reduced worker fatigue and improved productivity and worker satisfaction. The versatility of the Wave has helped Flyte Camp run a smooth operation by eliminating downtime that occurred as scaffolding and ladders were repositioned around vehicles. Employees are able to maintain stamina throughout long hours by the Wave’s ability to easily position workers and their equipment where they need to be and move efficiently around vehicles as a project progresses without having to climb up and down. 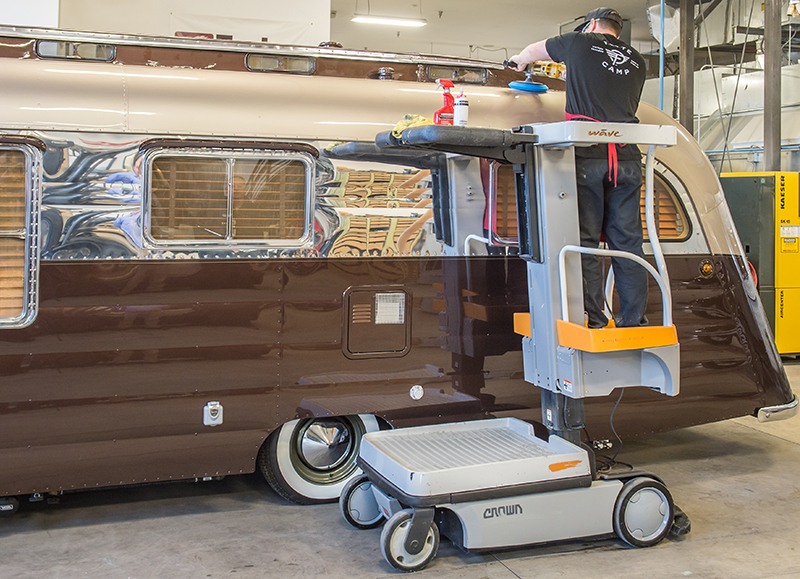 Furthermore, Flyte Camp selected the Crown C-5 Series to tackle the challenge of maximising productivity within their tight working conditions. Its industrial LPG engine and Crown Power Brake System provides the power and precision to move large trailers with accuracy and confidence, often with only inches of clearance. Employees appreciate the ergonomic controls, high visibility operator’s compartment and optional cabin that enables them to keep projects moving no matter the weather. The power, precision and manoeuvrability of the C-5 Series gas forklift enables operators to safely move virtually irreplaceable trailers in tight quarters sometimes with only inches to spare. The ergonomics and visibility in the C-5 Series’ hard cabin allows the operator to move the large trailers with ease and confidence, all year round. 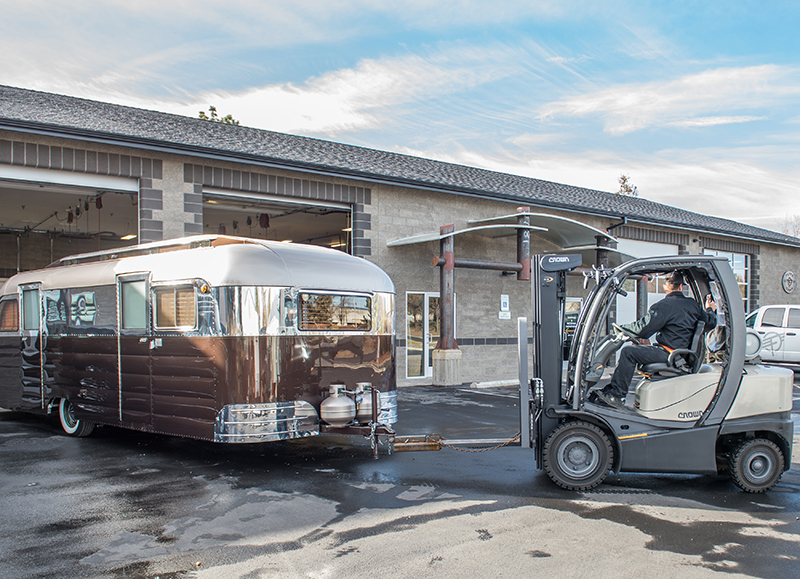 The company is recognised for new trailer builds and restoration projects that are known for their perfect blend of form and function, and the owners feel that the C-5 Series evokes that same feeling, not only with their employees but also with customers who visit the facility to view their project in process. The company’s global headquarters is located in New Bremen, Ohio, USA, with regional headquarters in Germany, Australia, China and Singapore. Its employees number more than 14,000 worldwide. Crown operates a service and distribution network that exceeds 500 retail locations in over 80 countries. To learn more about Crown’s ideas for helping customers advance the productivity of their operations, visit crown.com.